Your pinkies are not exactly your most...adept fingers. I don't mean to imply that I'd be happy to lose mine, but I'm also not exactly happy that the standard QWERTY keyboard sticks keys like Shift, Return, Delete, Tab and Escape out of the way where you need to stretch your pinkies to whack them. If you're an emacs user and have remapped Caps Lock to Control, things don't exactly get easier for your poor left pinkie. As I've been starting to research keyboard design, I came across a tidbit about the placement of the Shift keys -- The earliest Remington typewriters (the ones by the guy who devised QWERTY) were strictly uppercase affairs. The competition added lowercase through a simple if somewhat...brute force hack. They added a second keyboard. Remington contrived something else - they welded lowercase type to the same hammers as as the uppercase letters and contrived a mechanism to literally shift the typewriter's platen up so the lowercase type would make an impression rather than the uppercase type. As you might guess from that sort of a solution, there was an engineer involved. Apparently, an engineer who didn't want to spend time reengineering something they'd already built. So, when they went looking for a place to put their new platen shift keys, guess what they did with em? They bolted them on the side and a little out of the way. And that, my friends, is why Shift lives where it does. Another paper I was reading alluded to a study that said that one can not properly touch type on a keyboard with more than 50 keys. Looking down at my macbook air's keyboard...yeah. A few more than 50. So I set about trying to figure out a keyboard layout that wouldn't put so much emphasis on your least awesome fingers. 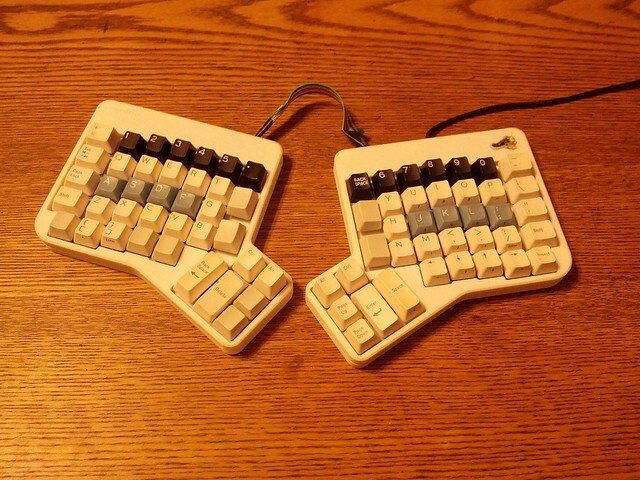 I'm working from the ErgoDox keyboard design I wrote about earlier. Those of you who are big into counting might count just over 75 keys there. 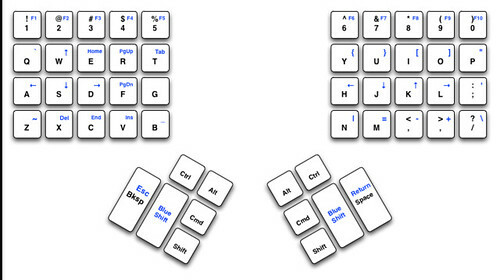 But the basic layout of the keyboard is what I currently have to work with. The layout I'm currently using is pictured below. What I've done is to eliminate all but a single column for each pinkie in favor of an additional "blue shift" layer. So far, I'm finding it fairly comfortable and getting used to it pretty quickly. I'd love comments and questions, though.